When I was eight years old I knew exactly what I was going to do for a living when I was older. There were no lofty ambitions to become an astronaut, or sensible plans to be a train driver or fantastical ideas to be an internationally-renowned footballer (anyway, they were paid less in the 70s). I wanted to become a music teacher. And with that pin-point focus and clarity I set about learning as many musical instruments as I could safely handle in my podgy eight year old fingers. Guitar, flute, drums, violin, piano – if it could be plucked, blown, hit or tinkled then I was in the queue to master it so I could achieve my unshakeable goal. Of course, life gets in the way and my career path followed a different and unexpected direction - but I never lost that joy of creative expression, and still revel in the calm that picking up a musical instrument can bring. It’s not just music that can have this relaxing and joyous effect. From pottery to painting, singing to stitching, drawing to dancing getting creative has been shown time and time again to have a positive effect on our wellbeing. And that’s the underlying premise behind Get Creative, a nationwide campaign to celebrate and inspire the everyday creativity that happens in homes and public spaces throughout the UK. During the annual Get Creative Festival organisations big and small are invited to put on and host creative, participatory events with the aim of getting as many people as possible to try something new, reignite a forgotten hobby or share their creative passion. This year during the Get Creative Festival from March 17-25 there were more than 1,400 such events across the UK, the majority of which were free. The breadth on offer was vast. There was adult therapeutic colouring in Burnley Library, crochet sessions at Pensby Library, a quilting workshop at Watford Central Library in Hertfordshire while Cumnock Library in East Ayrshire held an exhibition of local people’s photography. And there were Argentine Tango classes in Belfast, drawing sessions focussing on rugby fans on the streets of Cardiff at Wales v France; and hundreds of pottery taster sessions in studios across the UK. These are only a small selection of what was on offer but I’m thrilled that almost 500 of the total number of events were in public libraries – that’s more than a third. These venues are often the creative heartbeat of our communities, regularly hosting events and workshops from knitting circles and jewellery making to painting classes. I think that high number was due to the simplicity of the call to action. We said: “if there’s already something creative happening in your library during the Get Creative Festival period that’s free or cost recovery then please join us and be part of this national celebration of creativity and participation”. But it wasn’t just existing events that were part of the Festival. 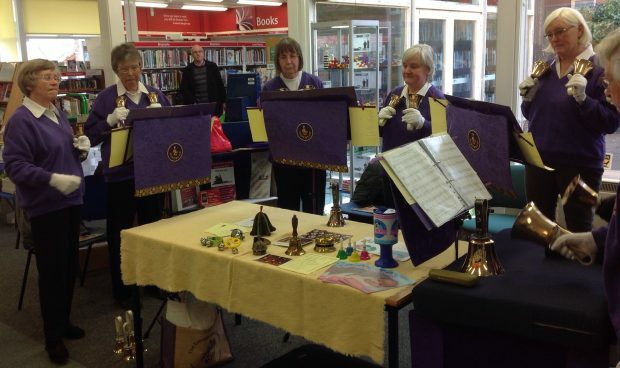 I don’t need to tell anyone reading this that libraries are also accessible and well-used venues and with the help and support of the Society of Chief Librarians the Handbell Ringing Association of Great Britain held taster sessions in a number of libraries across the UK including Portishead, Buckden, Minehead, Stroud and Teddington to name a few places. In Lancashire, all 59 libraries in the county put on an event during the Festival, and it’s truly wonderful to see an area embrace the spirit of Get Creative with such enthusiasm. In Ormskirk you could get creative with Lego (other building blocks are available), there were painting classes in Widnes and a beginners jewellery workshop in Rawtenstall. I hope each library felt it was a worthwhile thing to do and would look to take part again next year. 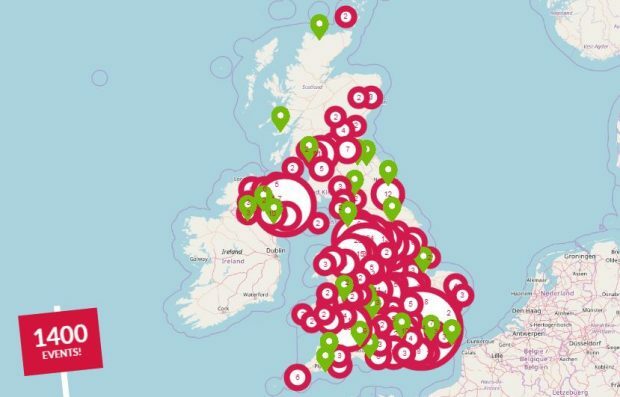 Thanks to funding from Arts Council England and Arts Council of Wales there was a Get Creative listings map which included every Festival event. I see the BBC’s role as ensuring that our audiences are made aware of what’s happening near them to give everyone the chance to get creative. At the BBC we’re very good at getting behind an initiative and almost every radio station reflected the festival in some way, while I hope Make! Craft Britain on BBC FOUR and The Big Painting Challenge on BBC ONE inspired audiences to try something new and creative. Partly due to that signposting on radio, television and online more than 11,000 people came to the listings site to find an event, while our Get Creative website was viewed by half a million visitors. Our Facebook content featuring inspiring stories of people who’ve found the joy of creativity notched up 14 million views. BBC Arts and Tomorrow’s World funded the Great British Creativity Test to investigate the link between creativity and wellbeing. Dr Daisy Fancourt, senior research fellow at University College London, will analyse the 50,000 responses and we’re looking forward to making those findings public in the autumn. Get Creative is run as a partnership by the Crafts Council, the Arts Councils in England, Wales and Northern Ireland, Creative Scotland, Voluntary Arts, What Next, Fun Palaces, Family Arts Campaign, 64Million Artists, Creative People and Place and the BBC. Preparations for 2019’s Festival have already started. It will be held from 11-19 May with planning meetings at BBC buildings across the UK in the autumn. We’re also looking at putting on workshops early in the new year for organisations who want to take part and might need specific help and support. It feels like the UK’s libraries are a perfect companion to the Festival and I hope many will take part next year with a similar array of enjoyable and varied events. If you’re interested in following our progress and keeping up with all the latest Get Creative updates, sign up to our newsletter (we’re fully GDPR compliant!) at https://www.voluntaryarts.org/get-creative-newsletter or for specific questions contact us at info@getcreativeuk.com. Hope to see you in 2019 to get creative!